If you are really crazy and want to read the diary that went along with this project in the early months of 2004 while I was still a high school student, you may go here. For the rest of you normal folks, I'm just going to quickly summarize and post pictures. The dress is made of navy blue Casa Collection crepe from Jo Ann Fabrics. 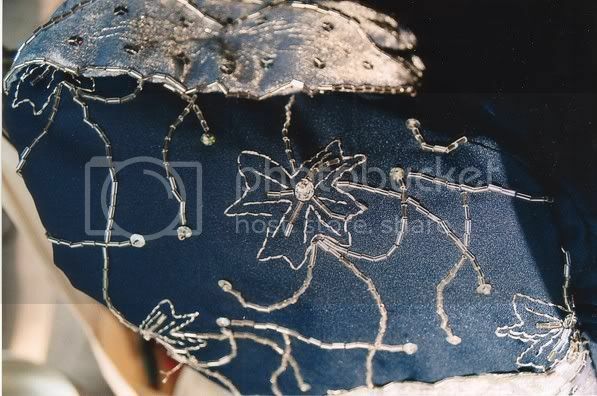 The sleeves are silver baroque satin from the same source. 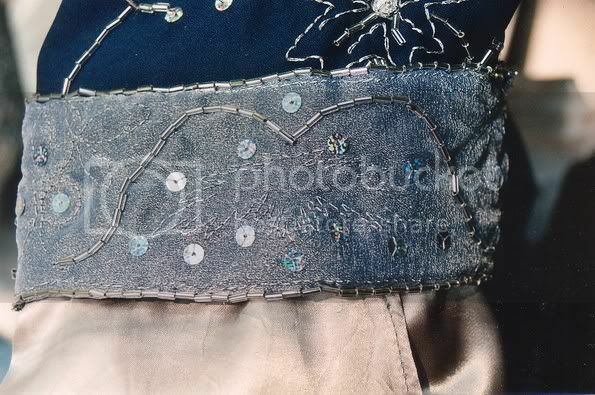 The trim is white sparkle organza from Hobby Lobby layered over more of the blue crepe, embellished with silver-lined clear bugle beads, metallic silver thread, and holographic silver sequins. December of 2003 marks the beginning of my insanity. A couple months before, some stills of The Return of the King were released and I decided to make what is commonly known in fan circles as Arwen's Requiem Gown. I decided, in my seventeen-year-old naievete, that I must have this dress and it must be fully hand beaded. 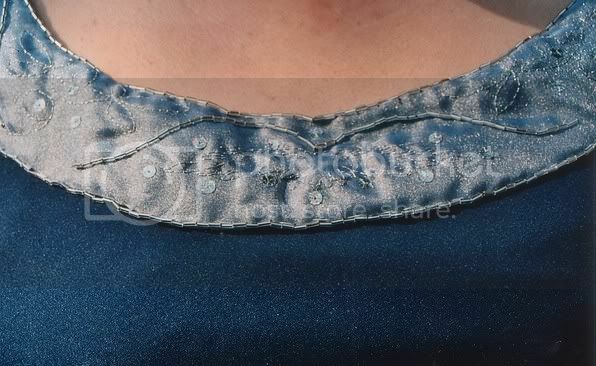 I spent hours beading sleeves and trim in order to go in costume to the premiere of the third movie in the trilogy--and go in costume I did. That's the first and definitely unfinished incarnation of this dress. 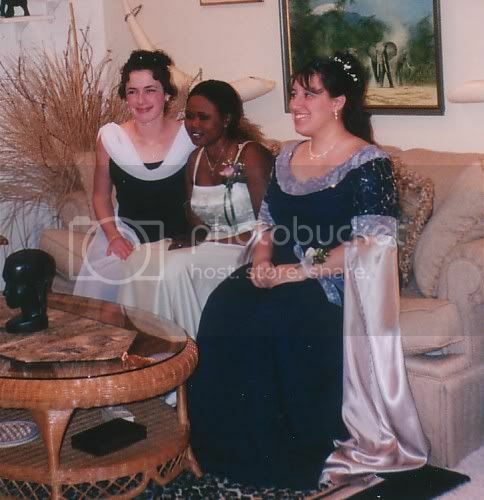 My mother decided I was a nutball but did nothing to stop me when I decided to finish the dress according to the original plan and wear it to my senior banquet. 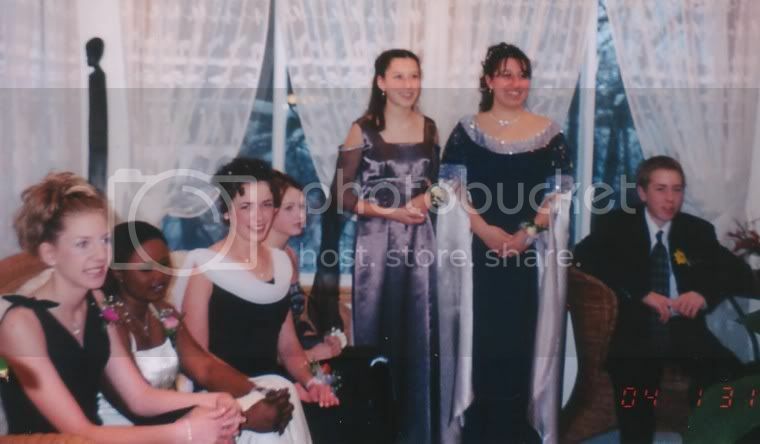 These were all taken in the days before digital cameras (*gasp! *), which meant we all waited with bated breath to see if they developed decently, and then had to actually put them on a scanner in order to get them online. 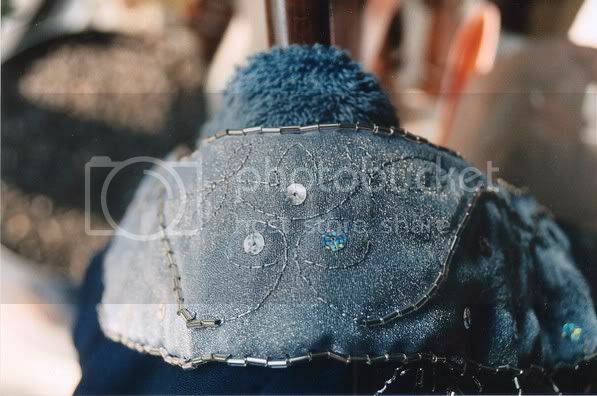 Now, I spent hundreds of hours beading this sucker and there was no way I was just going to wear it once and forget about it. Not to mention that I've since decided that I don't do embroidery because it enrages me just a little too much to be healthy, so this is probably the most complete surviving example of my mad backstitching skills. 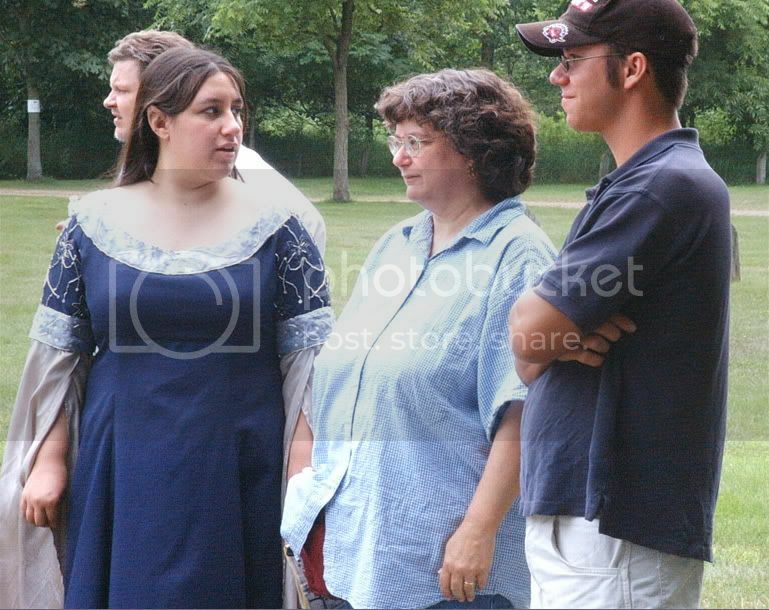 Lucky for me, my family enjoys going to Renaissance Faires in the summertime. I pulled out the fake ears (which I also wore to the premiere) for one more go-round that summer. It's probably irrational how much those pointy ear prosthetics pleased me. They've since gone the way of all flesh--that is to say, I left them in the rear window of the car on the way home and the latex melted and fused them together. I still kind of miss them, four years later. 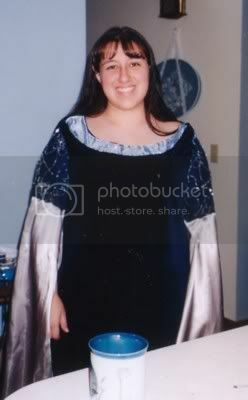 The only downside to being this insane at age seventeen was that people at the Silverleaf Renaissance Faire asked me if I'd made the dress, then didn't quite believe me when I said I'd done all the embellishment by hand. I got a lot of "Nuh-uh! "s and blank stares. And this was when my mother knew for sure that I was crazy. She just didn't realize the magnitude until a little while later.